Christina Wehner and Phyllis Loves Classic Movies are our hosts for En Pointe: The Ballet Blogathon running on August 4th, 5th and 6th. Film and dance were made for each other. Click HERE to enter the rehearsal and concert halls. We meet our mad genius on a rainy night in a circus tent in the European countryside. Our mad genius is a puppet master, literally and figuratively. While John Barrymore as Ivan Tsarakov and his assistant Karimsky played by Charles Butterworth manipulate the marionettes in their ballet, they play to an audience of one. 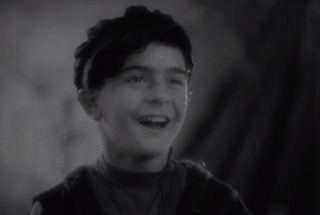 Young Fedor played by Frankie Darro, looking younger than his 14 years, is an abused youngster finding solace in the pretty dancing puppets. His revere is interrupted by the arrival of his father with a whip. The boy's dexterity at running and leaping to avoid punishment intrigues Tsarakov, so he hides the boy from the brutish father played by Boris Karloff. The club-footed Tsarakov takes the boy under his wing as an adopted son. Himself, the son of a premiere ballerina, Tsarakov was blessed with a genius for dance, a desire to dance, and the inability to do so because of his disability. He will pour his ambition and knowledge into the youngster and live his dreams through Fedor. The passage of time has brought the Tsarakov ballet company and its acclaimed lead dancer, Fedor success in Berlin. Karimsky still dutifully plays the role of Tsarakov's assistant. Fedor, now played by Donald Cook, idolizes his father/mentor and unquestionably follows all of his orders. The only crack in the relationship is Fedor's growing love for the sweet dancer Nana Carlova played by Marian Marsh. Nana has also caught the eye of the ballet's wealthy patron Count Renaud played by Andre Luguet. Nonetheless her heart belongs to Fedor. Life could not be more perfect for the young leading man of the company. Tsarakov, however, can see his control of Fedor slipping away. Tsarakov is of the firm, and somewhat maniacal, opinion that love has no place in the life of the true artist. If he is to be the greatest dancer the world has ever seen, Fedor's whole heart and soul must be devoted to his art. Tsarakov sees nothing wrong with flings. He enjoys working his way through the women in the corps de ballet, and sees no reason Fedor cannot emulate that attitude. "You can be one of the greatest artistes in the world. What more could anyone ask?" "If you love him at all you will go way and not murder the career of a genius." "You cannot have it both ways. A dancer who relies upon the doubtful comforts of human love can never be a great dancer. Never"
Fedor and Nana walk out on Tsarakov and are happy for a time in Paris. However, every job as a dancer is closed to Fedor when Tsarakov advises various managements of the exclusivity of their contract. When Fedor at last has come to working in a waterfront dive, Tsarakov takes advantage of Nana's depth of feeling to free Fedor and have him return to the fold. Once more under Tsarakov's influence, the kindly Fedor takes on the gruff manners of his mentor. Nana, who has moved on with Count Renaud finds him a more kindly "employer" than expected. He understands the plight of the young lovers and takes her to the company's opening night back in Berlin. It is at the successful premiere of a new ballet that everything comes to a violent conclusion. The Tsarakov Company's triumphant return to Berlin. The massive set includes a demon idol which sends Sergei over the edge in a drug fueled frenzy causing him to take an ax to the set. Tsarakov is as maddened as the dance master because Fedor has seen Nana in the audience and knows nothing, not even dance, is worth the loss of true love. A shadowy showdown between Sergei and Tsarkov leads to the death of the mad genius. 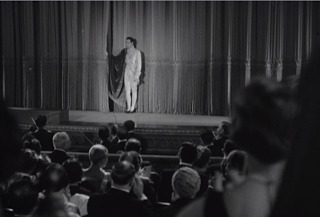 The curtain opens on his lifeless corpse causing panic throughout the audience. Through the uproar, Fedor and Nana find each other, and the always loyal Karmisky sits disconsolate beside the body of his friend. 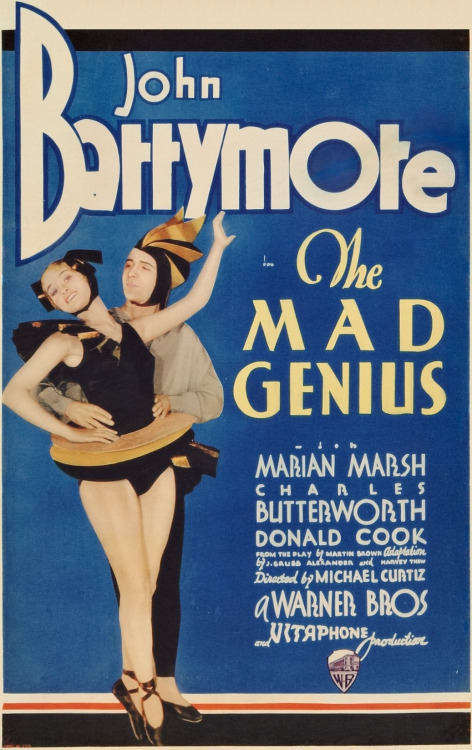 The Mad Genius was based on a play called The Idol by Canadian born Martin Brown. Brown was a successful Broadway playwright and lyricist, and a one time dancer. This melodrama was not one of his stage successes. Nonetheless, it made a fine Barrymore vehicle as a follow-up to the successful Svengali. The screenplay is by J. Grubb Alexander (Svengali, The Hatchet Man) and Harvey F. Thew (The Public Enemy, She Done Him Wrong). Michael Curtiz directed his only collaboration with Barrymore. Typical of Curtiz's work, the movie is well paced with many interesting shots of characters which silently comment on their relationships. Art direction is from multiple Oscar nominee Anton Grot (The Sea Hawk, Anthony Adverse, etc.) and he gives us an eyeful of over-the-top theatrical sets and apartments from the lavish to the simple. Earl Luick (Springtime in the Rockies, Union Depot) is credited with designing the gowns, so I assume Grot may have been behind the ballet costumes, at least the headdresses which disguise the dance doubles for Donald Cook (Charles Weidman) and Marian Marsh. Adolph Bolm, born in St. Petersburgh and a graduate of the Russian Imperial Ballet School became a choreographer after an injury ended his dancing career during a tour of the United States. His work on this film, and others like The Affairs of Cellini and The Corsican Brothers combined with his work for ballet and opera companies. 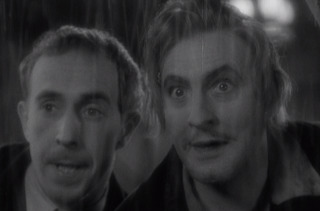 Like his Svengali, only better dressed, Barrymore is mesmerizing as the single-minded Tsarakov. If the co-stars can bring themselves to his level of commitment, they have plenty of room to do so. Charles Butterworth's hesitant characterization works to almost humanize the mad genius. 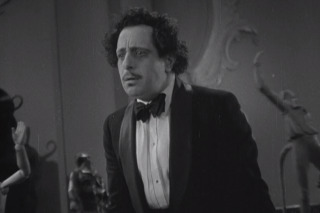 Luis Alberni, a lifelong second banana in second features, shows his mettle as the broken Sergei. For me, The Mad Genius is a must-see for John Barrymore fans and a fine complement to the earlier Barrymore/Marsh film Svengali. Perhaps, like me, you will find this even more to your taste than the famous earlier film. So wait a minute... a boy with a talent and a potential for greatness is taken in by a mentor, grows up, falls in love with a girl but is told love can only get in the way of his training... Sounds almost like the first two STAR WARS prequels! Ha! Ha! Ha! I don't know why that didn't occur to me, but now I've got a whole new spin on both. What fun! This is quite the interesting pre-Code! It sounds like someone put together elements of Lili and The Red Shoes and then added a crazed John Barrymore on top of it -- so basically it sounds great! Thanks for bringing the madness to the blogathon! 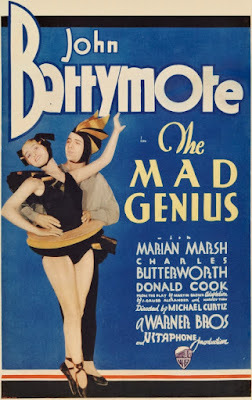 It is a crazy, wacky, mixed-up world in The Mad Genius, and totally engrossing. It is my pleasure to participate in this wonderful blogathon. John Barrymore, Svengali-like-sequel, ballet, comparisons with Red Shoes...you make an irresistible case for this film. I'm off to see if I can find it. It's difficult to imagine anyone more ideal for playing a mad genius than Barrymore. Thanks so much for joining and introducing me to this film! So true, the mad genius is Barrymore's bread and butter. I imagine his big sister and brother would agree. Like ships that pass in the night. 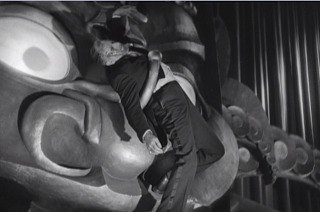 Karloff wants to know what they've done with his kid, and Barrymore plays dumb. Truly. The hubby says of Curtiz that he did not know how to make a boring movie. One of my favourite hidden gems of the 1930's. It is rather a hidden gem, isn't it? Funny how that happens. A lot of truth in those words. Barrymore might have been happier if he thought of them when he opened a bottle. Boris' role is brief, but I must confess it was his presence that first led me to this movie. I'm not sad that it did, because I found it engrossing. Pleased that the spoiler warning did its job. You must be very proud of Luis. I agree, it is a fine role and he handles it beautifully. 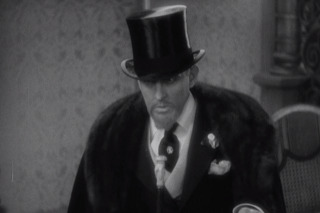 Another favourite performance of mine is in the 1933 western programmer The Man from Monterey. It is funny how in the most obscure, low budget movies, you find gems.